Bloodshot and swollen eyes, skin tanned and leathery, a thousand yard stare that makes the most traumatized of shellshock sufferers look positively fine, all are marks of the seasoned hawkwatcher at Quaker Ridge. But what a nice group of guys and gals, and there couldn’t be a more entertaining gang to spend your day with staring into the blank empty nothingness of a pale, cloudless blue sky trying to pick up the distant silhouette of an incoming raptor . I’d been initiated quietly into the world of pro Hawkwatching with some nice light days at the end of August where nothing much was drifting through apart from a few early returnees (many of them Bald Eagles!) Today however I was dropped into the deep end of Broad-wing craziness. The day started inauspiciously enough with just the one Kestrel making a beeline over the valley and scooting past me at head height. However as the clock ticked over towards 9:30am, suddenly things were changing fast. It started with just a handful of adult Broad-wings lifting up from the surrounding forests and starting to kettle up in the morning sun. In another 30 minutes I was quickly on the phone for battle hardened eyes to help to give me some chance of staying ahead of the approaching hordes. By 10:00am the clans had gathered and we had 10 or so of the regulars out front and doing their best to make sure that every bird was located and equally that none were counted twice. Of course this isn’t the easiest task, with the frantic call of kettle! or streaming birds! going up left right and center. Heated discussions break out amongst good friends as to which birds might have already been counted or not and tallies are quickly processed on the essential clickers. All through this madness,however the witty banter keeps flowing and the mood is one of excitement and fun as the hordes of birds keep flying. By 3pm (2pm Bird Time – which runs at EST for the count) bodies and eyes are tired, but the thrill and excitement of the first good day is finally settling over everyone and we coast the last couple of quiet hours reflecting on a job well done. Another exhausting but fun day at the Hawkwatch and my first real experience of a full day of Broadie madness. 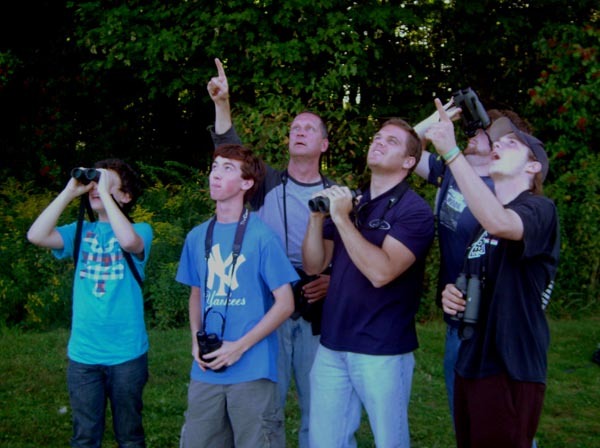 It’s an incredible spectacle, so get yourself down here to Quaker Ridge in the next few days before you miss out on all the Broad-winged fun! You can find information about the Quaker Ridge site on Hawkcount (here) and see a daily roundup of our sightings here. Looks like tomorrow may be another good day (if so, I’ll see you at 3! ), then winds will apparently shift to a more eastern/southerly direction around Wednesday. Maybe, just maybe, that could set us up for a nice weekend once it switches back north, but too early to tell.